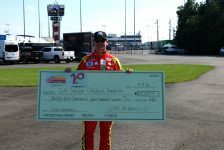 RICHMOND, VA—GPM Investments, LLC, announced today its Village Pantry® and Next Door Store convenience stores donated more than $32,500 to the Jeff Gordon Children’s Foundation. Funds raised during their 2016 Icon Campaign will aid in the support of childhood cancer research. From June 20 through July 10 of this year, 161 stores in Illinois, Indiana, Ohio and Michigan collected $1 donations for a paper icon featuring Jeff Gordon and nine-year-old Olivia, who was diagnosed with bilateral retinoblastoma – a very rare cancer that causes the growth of tumors in the retinal cell layer of the eye – at three months of age. Thanks to advances in pediatric cancer care and treatment, Olivia just started the fifth grade and her favorite pastimes are painting, reading and watching baseball and hockey. Over the past 10 years, Village Pantry and Next Door Store convenience stores have raised more than $2 million for the Jeff Gordon Children’s Foundation to help kids like Olivia. Jeff Gordon Children’s Foundation was established as a nonprofit 501(c)(3) organization in 1999 by the four-time NASCAR Cup Series champion. The foundation supports children battling cancer by funding pediatric medical research dedicated to finding a cure and treatment programs that increase survivorship. 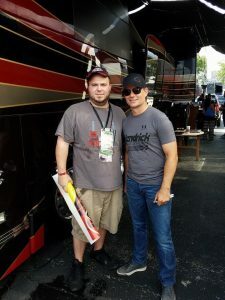 Visit www.jeffgordonchildrensfoundation.org to learn more.